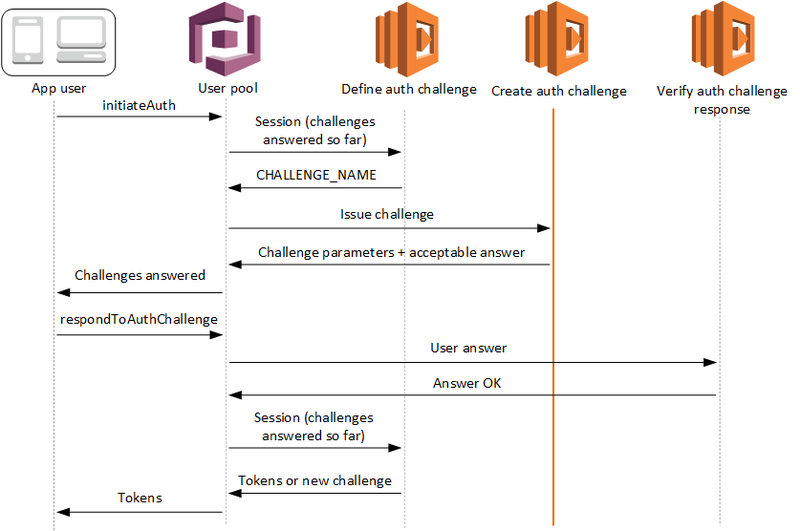 Amazon Cognito invokes this trigger after Define Auth Challenge if a custom challenge has been specified as part of the Define Auth Challenge trigger. It creates a custom authentication flow. This Lambda trigger is invoked to create a challenge to present to the user. The request for this Lambda trigger includes the challengeName and session. The challengeName is a string and is the name of the next challenge to the user. The value of this attribute is set in the Define Auth Challenge Lambda trigger. The challenge loop will repeat until all challenges are answered. These are the parameters required by this Lambda function in addition to the common parameters. One or more name-value pairs representing user attributes. The name of the new challenge. The challenge type. One of: "CUSTOM_CHALLENGE", "PASSWORD_VERIFIER", "SMS_MFA", "DEVICE_SRP_AUTH", "DEVICE_PASSWORD_VERIFIER", or "ADMIN_NO_SRP_AUTH". Set to true if the user successfully completed the challenge, or false otherwise. Your name for the custom challenge. Used only if challengeName is "CUSTOM_CHALLENGE". One or more key-value pairs for the client app to use in the challenge to be presented to the user. This parameter should contain all of the necessary information to accurately present the challenge to the user. This parameter is only used by the Verify Auth Challenge Response Lambda trigger. This parameter should contain all of the information that is required to validate the user's response to the challenge. In other words, the publicChallengeParameters parameter contains the question that is presented to the user and privateChallengeParameters contains the valid answers for the question. Your name for the custom challenge, if this is a custom challenge. A CAPTCHA is created as a challenge to the user. The URL for the CAPTCHA image is added to the public challenge parameters as "captchaUrl", and the expected answer is added to the private challenge parameters.